Lee Nettles, executive director of the Outer Banks Visitors Bureau. Gov. 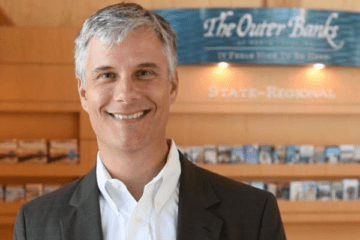 Roy Cooper has appointed Lee Nettles, executive director of the Outer Banks Visitors Bureau, to serve on the board of directors for the Economic Development Partnership of North Carolina (EDPNC). Nettles joins the 17-member governing board with key industry and business leaders from across the state recognized for their talent and experience in various sectors. “I’m honored to represent North Carolina’s tourism industry on the EDPNC board. It’s a vital sector producing nearly $24 billion in direct annual spending and supporting 226,000 jobs in North Carolina,” Nettles said in a news release. The EDPNC is a nonprofit, public-private partnership operating under contract with the North Carolina Department of Commerce and receiving additional financial support from the private sector. The EDPNC focuses on recruiting new businesses, supporting the needs of existing businesses, connecting exporters to global customers, helping small business owners get their start, and attracting visitors from around the world. Congratulations Lee – I know you will do great things!